I remember my mum would make handvo (Indian savoury cake) nearly every Sunday. If we were going to Drive In to watch a movie or having a meal at home, Sunday would be handvo day. She would make it on a jiko (sigri) with more hot coal on top of the pan or sufuria. That handvo always tasted yummy and soft. Modern times and the charcoal stoves are out and in come the ovens. Not the same as the jiko one but I still make handvo as its one of my favourite snack. I never made handvo on my own when I got married as Nunu, my mother in law would bake it. She would add onion, carrots, cabbage, doodhi (bottle gourd) and so many other ingredients. My bhabhi adds cooked peas. Any version and they all taste good. Make a thin layer or a thick layer, the choice is yours. Add whatever vegetable you like. The more the merrier! Ready made handvo flour is available in most shops but I prefer to make it with soaked rice and lentils.The handvo turns out softer. If you’re fighting for time then go ahead and use the ready made handvo flour. Every Gujarati household will have their version of handvo. Some add only bottle gourd(doodhi) and fresh fenugreek. Some love it extra chili and sweet. Some love it with more oil. Handvo is one snack that is made when one is traveling, going for picnics or as a light meal or snack to be enjoyed any time of the day. Some like their handvo soft but my family loves it when there is a crust at the bottom and top. Everyone fights for the side pieces and the inner soft ones get left till the next day. Whenever I prepare handvo for tea parties I like to bake them like muffins. However, please do not use cake paper cups. I prefer using the silicon moulds as the handvo comes out easily. First time when I tried baking them like muffins, I used the normal aluminum moulds and though I had oiled them, it was a struggle to remove the handvo. I left them in the mould and we spooned it out when we had it. Soak rice and lentils separately for 6 to 8 hours in lukewarm water. Drain out the water, wash the rice and lentils. Process the rice and then the lentils in a food processor into a grainy and coarse consistency. Add yogurt, warm water and ¼ tsp methi seeds to the mixture and mix well. Cover the mixture and leave it to ferment in a warm place for 6 hours. Once it is fermented add the sooji, vegetables, salt, sugar and spices except for the baking soda. Heat oil for tempering in a small pan. When it is hot add cinnamon, cloves, peppercorns, methi, dry chillis, mustard seeds, cumin seeds, carom seeds and finally hing. Pour the tempered oil into the batter and mix it well. Finally add soda bicarbonate and mix well. Grease a tray about 16X12 inches with the oil. Pour the batter into the tray and level it out with a spoon. The batter should be a bit runny. Sprinkle the sesame seeds over it. Put the tray into the hot oven and bake the handvo for 30 minutes. After 30 minutes increase the temperature to 200°C and bake further for 10 to 15 minutes to allow the top to becomes brown or place it under the hot grill or broiler for 5 minutes. Remove the handvo from the oven. Let it cool down a bit in the tray before you cut it into pieces. Serve with nice masala tea or milk. Add grated cabbage instead of doodhi or a bit of both. Add finely chopped spinach (palak). For a more crunchier top, add extra oil on top before baking. The size of the tray is just a guidance, use 2 small trays or any you prefer. As I mentioned before, depends on how thick or thin you want the handvo to be. Add grated zucchini along with the doodhi. Love the colour of your handvo. I too usesilicon muffin cups now. You are right – the handvo we made on the sagri tasted so good. Handvo is one dish I am yet to make..your cake looks so yum! Wow, new clicks rocks Mayuri, though handvo calls for a long list of ingredients i dont bother to make them soon at home. Irresistible definitely. Such a healthy & tasty snack !!! Never tried my hands on handvo so far, bookmarked to try. Very inviting !!! Handvo looks too good. My next door neighbors are Gujarati's when ever they make these kind of snacks, they make sure I too get some of these. This is one dish that I've been wanting to try for some time now. If I were to use handvo flour, should I just skip steps 1-4 and mix the flour with yogurt? The handvo tea combo is such a classic Gujju combo..even we love it. Handvo has come out so good. Baked tray of handvo picture (last second one) is inviting. I recently made handvo at home from scratch, soaking rice & lentils. I totally loved it. 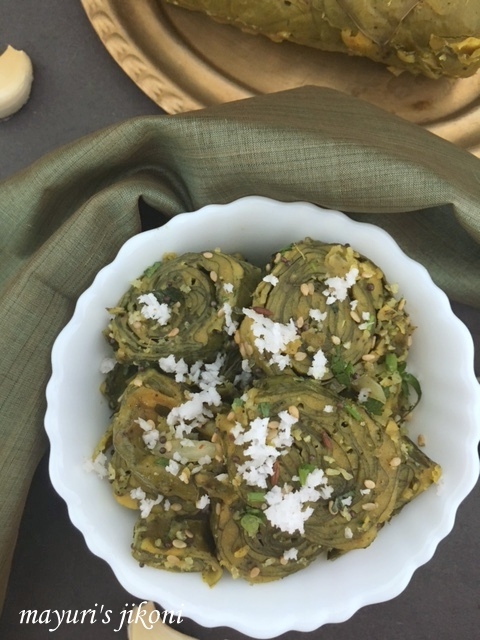 I am yet to make handvo but have tried it several times at a Gujrati friend's house. The tray pics are so beautiful. I am yet to try this much acclaimed Gujarati snack. The clicks look super inviting. I am tempted to make it today. One of my friend always makes me tray full of handvo. We moved from that city and no longer get to eat hers. Love the recipe and your clicks make it so inviting! Beautiful presentation Mayuri.Love the ones in the muffin mooulds. wow, just wow, that toppings is calling my name!! i love crunchy sesame seed topping!! 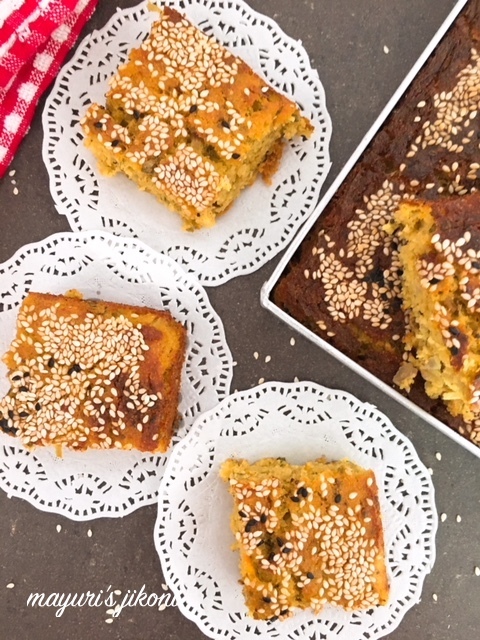 Handvo is our favorite snack at home, baked version looks perfect!! !